On 21 August 1969, an Australian citizen called Denis Rohan set fire to an 800-year-old wooden pulpit, a gift to al-Aqsa mosque from the Islamic hero Saladin (1137-1193), who led the military campaign against the Crusaders. Apart from being considered mentally ill, Rohan thought he was acting on divine instructions. These were to enable the Jews to build the temple on the ruins of the mosque, thus hastening the second coming of Jesus Christ. The arson attack which destroyed the ancient pulpit and part of the roof had a galvanising effect. A month later, 24 leaders and representatives of Muslim countries met in Rabat and created the precursor of a group now known as the Organisation of Islamic Cooperation (OIC). This group, now 57 nations strong, met in Istanbul on Wednesday. Just as it had 48 years ago, Al Aqsa galvanised them – once again – into action. Instead of being attacked by an Evangelical Christian from Australia, Al Aqsa was threatened by a US president pandering to similar messianic Christians in America. The conference achieved a number of goals. It made an historic decision to recognise East Jerusalem as the capital of the State of Palestine, thus pitting 57 states against Israel’s express intention to unify the city of Jerusalem. This move sets a heavy diplomatic ball rolling around the world, one that will roll independently of Israel’s or America’s will. It could roll all through Asia, Latin America and Africa. And it will make it more difficult for other nations to quietly move their embassies to the city. Today the US vice president Mike Pence delayed his visit to Israel. The summit placed Palestine once again in the centre of the Muslim world after seven years of the Arab Spring, the wave of popular uprising that swept across the region in 2011, and the reign of Islamic State group (IS) in both Iraq and Syria. As a result the seminal Israel-Palestine conflict receded from view. It also sidelined the conference which Saudi Crown Prince Mohammed bin Salman laid on for Donald Trump in Riyadh last May. A US president lecturing Muslim leaders on Islamic extremism was superseded by one in which Muslim leaders lectured him on his own fundamentalists. Realising they were about to be upstaged, the Saudis panicked. They sent a junior minister of Islamic affairs to Istanbul, excised all coverage of the event from their own media, and fed another story in the works about Al Jazeera’s coverage of Jerusalem protests acting as an incitement to violence. More importantly, Istanbul laid the foundations for a realignment of Arab states. It showcased a rebellion by two key pro-Western Arab leaders, King Abdullah of Jordan and Mahmoud Abbas, the Palestinian president, against their traditional allies in Washington. The former is the head of the second Arab country to recognise Israel, the latter is the Palestinian leader who has devoted his life to negotiating the now-defunct two-state solution. Realising the importance of what was about to happen in Istanbul, Saudi Arabia and Egypt made strenuous efforts to stop Abdullah and Abbas from going. As has been reported, Abdullah and Abbas were summoned for an urgent meeting in Cairo. Only Abbas turned up. I am told by well-informed sources, who spoke on condition of anonymity, that Egyptian President Abdel Fattah el-Sisi put pressure on Abbas so as not to head the Palestinian delegation to Istanbul and thus downgrade the importance of the conference. To help him decline his invitation to Istanbul, fake news was spread that Abbas had had a stroke. Abbas ignored this. Meanwhile King Abdullah was summoned to Riyadh, and there again I am informed, he was told not to attend Istanbul. King Abdullah stayed for a few hours in Riyadh and then left for Istanbul. Their attendance at the conference sent a message to Saudi Arabia as well as to the US: Riyadh’s deal with Trump is not accepted by Jordan and Palestine and in this they are supported by Muslim countries. In other words: You have no blank cheque to negotiate with Israel over our heads. Both men made a public display of their defiance and anger by standing shoulder to shoulder with the fire-breathing Islamist-leaning Turkish President Recep Tayyip Erdogan in the group photograph. Abbas then gave the speech of his life. He tore into America for wrecking his life’s work of pushing for a two-state solution. Jerusalem, he said, crossed all red lines. He revealed he had a gentleman’s agreement with Washington on not seeking full statehood and membership of all international organisations before a lasting peace was signed, and proceeded to tear that up. This means Palestine will be free to launch a case against Israel in the International Criminal Court. And thirdly he would take a complaint against the US before the UN Security Council for violating one of its own resolutions, a procedure against which the US itself cannot vote, Abbas claimed. Neither men are natural allies of Erdogan. Two years ago, Abdullah flew to Washington to brief Congressional leaders about the dangers posed by the Turkish president to regional order. Abbas feels the rivalry of Hamas keenly and has repeatedly attempted to pull Fatah out of the unity government. What force propelled the two men to Istanbul, and to a conference they knew could change the alignment of the entire region? It had to be something powerful to overcome their natural disinclination to stand with Islamists. Both turned to the man who, according to the latest Pew poll, is considered the most popular in the region and to the country, Turkey, which is looked at as the most influential regional power, after Russia. Domestic politics played its part. Both knew anger on their own streets was intense. Amman saw the biggest street protests in decades. More than half of Jordanians are Palestinian refugees, including those displaced from Jerusalem after the 1967 war. And the majority of Amman residents are either Palestinian refugees or Palestinians with Jordanian citizenship. Both saw Donald Trump’s recognition of Jerusalem as the capital of Israel as an act of political betrayal. For Abbas, it betrayed an unwritten agreement he had with Washington not to press Palestine’s case in the International Criminal Court until a final settlement was reached. For Abdullah, betrayal was no less real. 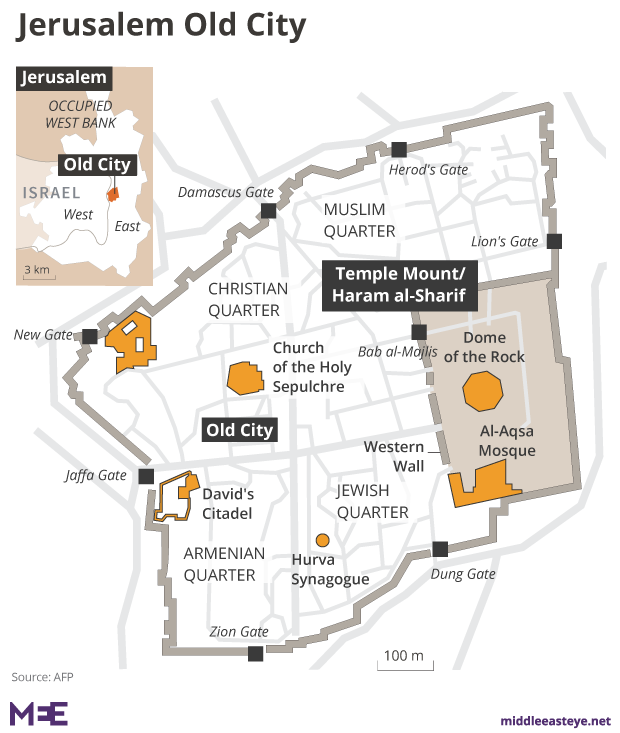 Jordan’s role as custodian of Al Aqsa is not casual. It’s written into peace treaties, notably the Wadi Araba treaty King Hussein signed with Yitzhak Rabin of Israel in 1994. Similarly, when King Hussein announced in 1988 the disengagement between Jordan and the West Bank, recognising the PLO as the sole representative of the Palestinian people, the king insisted Jordan would keep the custodianship of Al Aqsa. But the third reason for the offence both Abbas and Abdullah have taken is the most interesting of all. It’s personal. Their anger is genuine. In Abbas’ eyes, Trump betrayed decades of work towards the establishment of a Palestinian state. Abbas played patsy to an expanding Israel, and paid the price daily for that by doing Israel’s law enforcement for it in territory it would never leave. For Abdullah, it’s an insult to his family – a Hashemite, not a Palestinian one. I became convinced of this after a long conversation with a member of the royal household. The Hashemites still remember the time when they were custodians of all three holy sites of Islam – Mecca, Medina and Jerusalem. This was in 1924, when Hussein bin Ali al-Hashimi, the Arab leader who proclaimed the Great Arab Revolution against the Ottomans, held Mecca and Medina under his control. In the same year, the people of Jerusalem gave him the right to control their city. However late in the same year he lost his kingdom, Hijaz, to the Saudi Sultan Abdulaziz bin Saud. Jordan is all that remains of what is still called the Great Arab Revolution sparked by the great grandfather of Abdullah. The only source of religious legitimacy for his family is the custodianship of the Al Aqsa. When the 32-year-old upstart Saudi crown prince tells Abbas to forget Jerusalem and the right of return, history is repeating itself in Hashemite consciousness. They have not forgotten their feud with the House of Saud and their loss of two of the three holy places all those years ago. It still rankles. Jerusalem, then, is not just a foreign issue in a foreign country. It’s a test of their very legitimacy as rulers in their own country. Family history tells Abdullah that when they let a fundamental element of their legitimacy as rulers slip from their grasp, it is lost for ever. Abdullah’s choice carries its own risks. Sceptics may say he could just have chosen the losing side, once again. All the wealth, most of the military power and high technology are controlled by the opposing camp of Saudis, Emiratis, Israel and America. Together they make a strong force. But he will also remember how his father King Hussein rejected the winning side three times in his long reign, heeding to his instincts as an Arab. In 1967, the Israelis warned Hussein not to get involved, but he did anyway. Hussein reconciled with his old enemy, Egypt’s Gamal Abdel Nasser. “It wasn’t possible for Hussein to opt out [of] this war. If he had, everyone would have blamed him for the defeat,” Leila Sharaf, a former Jordanian information minister told an Al Jazeera documentary. In 1973, Hussein sent troops to help Syria in the Golan Heights to fight in the war launched by Anwar Sadat and Hafez Assad. Hussein supported the Iraqi leader Saddam Hussein in the first Gulf war in 1991. Each time, Jordan consciously sided with fellow Arabs even though it knew they were headed for defeat. Hussein did not foresee the extent of that defeat in 1967 but he did know Jordan would be defeated. Why? Because to do otherwise would be to incur even greater, possibly existential risk. This is the position that Abdullah now finds himself in. The worst part of Trump’s statement for Jordan was the US president’s insistence that recognition of Jerusalem as Israel’s capital reflected reality. Trump was not bothered by legality, international law, treaties, UN resolutions, all refusing to accept Israel’s annexation of East Jerusalem. It was the transformation of Jerusalem into another “fact on the ground” that Israel had established through conquest and settlement that made it impossible to accept. 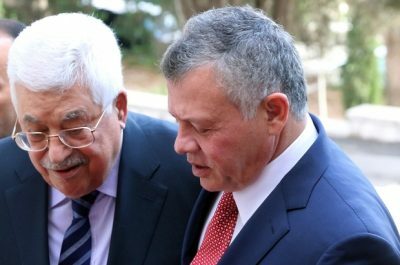 For once, and I never thought I would write this, King Abdullah and President Abbas have earned their position as Arab leaders. David Hearst is editor-in-chief of Middle East Eye. He was chief foreign leader writer of The Guardian, former Associate Foreign Editor, European Editor, Moscow Bureau Chief, European Correspondent, and Ireland Correspondent. He joined The Guardian from The Scotsman, where he was education correspondent.